Cuphead is one of the most highly anticipated independent games coming out this year and as soon as you take one look at it it's not hard to understand why. Its stunning hand-drawn animation helps it stand apart like no other game has in years and from its first announcement all the way back at E3 2014, we’ve wanted to get our hands on it. At Gamescom 2017, just one month before the game’s September 29 release date, we finally got our chance. When a game has been hyped as much as Cuphead has you can’t help but feel some trepidation when you pick up the controller for the first time. It has so much to live up to and so many expectations to meet. Will it manage it? With Cuphead we both got what we wanted and were pleasantly surprised. It’s an eclectic game with a lot of inspirations and this works for it. Thankfully, the dreaded No Man's Sky curse has not struck again. To help you decide whether or not you’re still on board with the hype, we’ve put together a list of 5 things you need to know about the game that we learned from our time with it and its developer, StudioMDHR. Let’s face it - this one you probably already knew. Cuphead captured our attention and imaginations when it was debuted at Microsoft’s E3 conference in 2014. Its hand-drawn animations that are so reminiscent of 1930s cartoons were refreshingly new in terms of gaming. By being so old, they brought an entirely new look to the well-worn genre of 2D side-scrolling platformers. We also loved the soundtrack - jazzy and up-tempo, it really reflected and enhanced the visuals. Though we could tell from the off how lovely the game is to look at and listen to, when talking to members of Studio MDHR who worked on it we found out just how much actually went into making it that way. If anything it made us appreciate it more. The game was entirely hand-drawn with pencil and paper and later hand-inked. The original jazz soundtrack, which comes in at around 3 hours long, was performed by a 10 piece rag-time ensemble, a 13-piece big band, a barber shop quartet and even features a tap dancer for that extra authenticity. This is commendable painstaking attention to detail, particularly from what started as a small development team of only two. It pays off completely, and as a result you’re left with an experience that feels authentic and crafted with care rather than gimmicky. Don’t let appearances deceive you. Cuphead might look lovely but it's far from it. It’s controller-grippingly difficult and you will die a lot. We barely made it through one of the game’s platforming levels in our time with it. Cuphead’s fast-paced run and gun gameplay takes place in levels that feel highly original. You have 3 kinds of guns at your disposal and, while it’s possible to learn attack patterns and remember which jumps need to happen where, the game will still occasionally throw small randomized changes at you that will completely throw you off balance. That enemy that for your past 3 attempts was running towards you might instead suddenly come in fast from behind. You need to be on your toes at all times; there’s no room for complacency or over-confidence here. Even though we were sufficiently challenged by the game’s simple setting, it’s clear that there’s a learning curve as our performance improved incrementally with each attempt we made at the level. When you do finally feel comfortable at this level you can turn up the difficult a further notch and challenge yourself more. If you complete the game on this higher difficulty level you then unlock its highest level. Cuphead’s varying degrees of difficulty (none of which are easy, may we add) give the game a nice replay value that will particularly appeal to those used to the trial by fire mentality of traditional platformers. Cuphead isn’t just a straight-up platformer. In fact, it has two kinds of levels for you to play: the run and gun platforming levels and the ‘stand your ground but prepare to dodge’ boss battles. In both kinds of levels standing still is tantamount to foolishness and eventually death, but the kind of movement required of you in each is different. The platform levels feel far more hurried and fast paced and you don't necessarily have to kill every enemy that appears - considering they're infinite that'd be one hell of an ask. Instead you just have to get to the end without dying yourself. The boss fights on the other hand involve much more dodging and dashing. The boss (always with an entertaining character design) takes up most of the screen while you dance around them, shooting and avoiding projectiles. Having both of these kinds of levels is great for the game’s pacing and sense of variety. The pacing is also helped by the fact that you wall across an interactive mini map (somewhat reminiscent of the one in the original Rayman) to move between them. However it's much more interactive and allows you to chat with characters from the world. It's a nice bit of breathing space between the two chaos modes. Cuphead can definitely be enjoyed solo but it wouldn't really be a game that hearken back to days gone by without a local co-op mode would it? The boss levels in particular benefit from having a friend involved as long as you're able to coordinate well with them and you can revive one another as often as you like. Plus, it's great to be able to blame someone else for your failure when you realize just how hard this game can be. 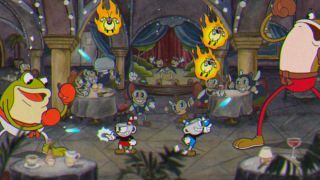 Cuphead might look and sound like it comes from the 30s but it plays like something from the 80s and 90s. At Gamescom a member of the team told us they were heavily inspired by the side-scrolling platformers from this iconic era. Considering our experience of playing Cuphead was agonising and delightful in equal measure, we’d say they’ve managed to capture the titles of this era fairly well. The health bar for bosses is even missing for extra authenticity (you can, however, go into the game’s settings and turn it on if not knowing how close a boss is to death is tantamount to torture for you). Other modern nods are included such as infinite lives, infinite bullets and the fact that your progression is saved. To be honest, in light of everything else these modern additions sound like humane ways to spare player sanity. Cuphead is a mishmash of a variety of eras and it really works in the games favor to stand apart from other titles available now. It might be another retro-inspired 2D side-scroller when you dig really far down but it’s done with enough style, flair and clever level design to feel genuinely different. We’re looking forward to playing more.